Why Do Puppies Eat Poop? Puppies and kittens brought up together get along famously. Even adult pets can learn to live with “that weird critter” if they’re introduced properly. One of the most common problems, though, involves teaching your new puppy to respect and not repeatedly chase your cat. Some dogs feel compelled to chase cats. For herding and terrier types, motion triggers their inborn predatory instinct to pursue. Cats, of course, do not appreciate being turned into a wind-up toy for the dog’s amusement. In some cases, the “chase” becomes life-threateningly serious. Fortunately, there are a few techniques you can take to teach your puppy to refrain from the chase, enforce good behavior, and keep kitty safe. In serious cases where you truly fear the fur will fly, a muzzle for your puppy may be the best and safest option. A basket muzzle is a good option for keeping the cat safe around a clueless puppy. Show the dog the muzzle. Let it sniff the muzzle so it becomes a familiar item. Hold the basket muzzle like a bowl. Put a favorite treat inside and show it to the dog. Hold the muzzle so the pup sticks its nose inside to get the treat. Repeat feeding your pup the treat from the muzzle a dozen times. Finally, fasten the muzzle and reward the dog with several treats for tolerating it. Then take it off. Do not offer treats unless it's wearing the muzzle so the dog associates wearing it with treats. For dogs that salivate at the sight of the cat, make sure the muzzle is worn whenever you can’t supervise the pair. Most dogs don’t mean to hurt the cat, rather they just can’t resist the lure of the chase. Trainers suggest a couple of approaches that can cure this. One method is to use a protective carrier for the cat while the puppy is under leash control. Use this technique only if your cat is a confident feline and won’t be unduly stressed. Shy cats should not be subjected to this situation. Place your kitty in a protective carrier while the puppy is in another room. Provide a toy or catnip to help keep the cat calm. Bring the puppy into the room and offer its favorite treats one after another to keep it focused on you and to reward the calm behavior. Ask the pup to practice a sit, to follow you on the leash in a heel position, or to stay on command. 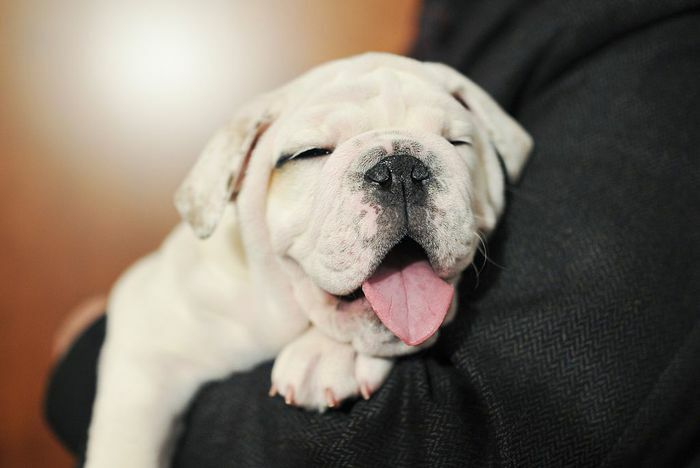 Practice obedience commands your puppy knows very well and reward it for obeying. Offer the best treats for moving or looking away from the cat. The idea is to teach your puppy that it gets better attention and rewards by ignoring the cat rather than pestering it. The "cookie cat" technique works more quickly. Just as Pavlov conditioned dogs to salivate when they heard a bell, you can teach your puppy to respond to the cat’s presence in a way that makes it impossible to start the chase. Ensure the cat’s safety by keeping your dog under leash control and prevent any chase from taking place. 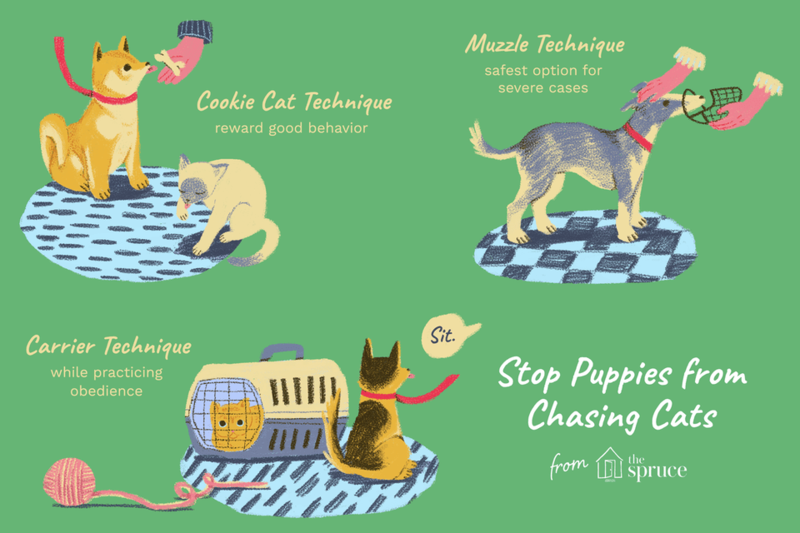 Most puppies prefer cat-chasing to any other reward so don’t allow your pup to get a taste of it. Have plenty of smelly, tasty treats handy. These should be irresistible and something the puppy only gets for this exercise. Don’t confine the cat at all. Allow it to move around at will while you keep the puppy’s attention on you as much as possible by teasing with the treats. Each time the cat makes an appearance, moves, or otherwise draws the puppy’s attention, give a tiny taste of a treat. Partner this with the CLICK cue of the clicker if you have clicker-trained your dog. Be consistent. Offer this treat-CLICK reward every single time, whether your puppy is calm, excited, looks at the cat, barks, or anything else. The equation should be: A cat's presence equals dog treat. Use the leash to keep your puppy safely out of paw-reach of the cat, but not to force its attention. You want the puppy to choose to look at you for the treat, not be forced to do so. Given time, the puppy's brain will connect the dots and figure out that when it sees the cat, it should look to you for a treat—it's impossible to chase while accepting that yummy treat! Continue to reinforce this behavior for at least a week or more. With consistency, most dogs will get it within only a few sessions. Make sure the dog stays leashed and the pets separated when not supervised until you're confident the new canine response has become ingrained. If you see any signs of the dog reverting to the chase behavior, go back to the beginning of your training. It may just require a few more sessions to really instill the desired behavior. Once your puppy has learned the limits, you can try some off-leash sessions with the cat. Always be sure your feline friend has plenty of “second story” territory like the backs of chairs and cat trees or shelves to stay safely out of nose reach. In time, both the puppy and the cat can learn to accept and respect each other, and perhaps even grow into a furry friendship.